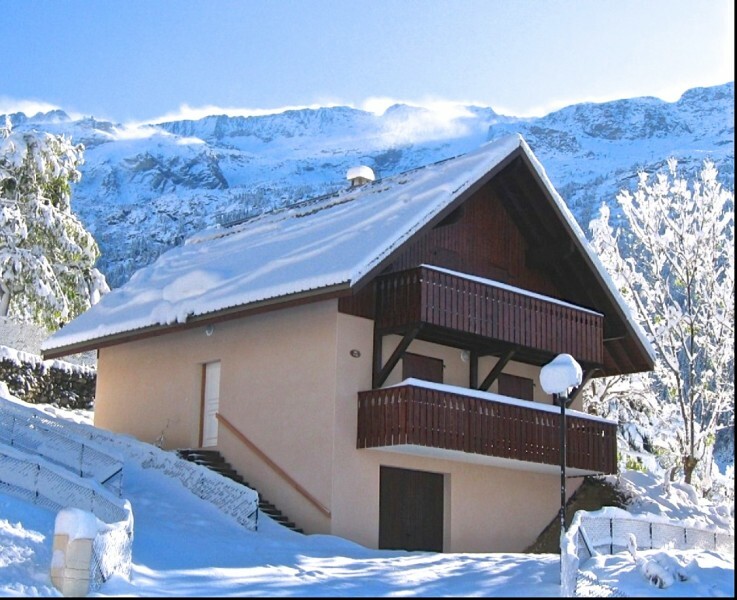 This modern chalet was built in 2008 and is located in the hamlet of Pourchery, 2km drive from Vaujany and the variety of modern leisure facilities including ice rink and aqua centre. The chalet is one of 5 and sits on a plot of land 400m2 with fantastic views towards the Lac Du Verney and surrounding mountains. The chalet has a total habitable space of 121m2 and a total floor space of 139m2. Built over three levels the chalet comprises on the ground floor of a spacious, tastefully decorated open plan lounge dining area with wood burner and separate kitchen. 2 sets of double patio doors open onto the balcony to the front of the chalet with views towards the Lac du Verney and Allemond. Another set of patio doors open on to the large terrace (35m2) and the garden to the side and rear of the chalet. Also on this level we have a twin bedroom, separate toilet and the hallway with wooden staircase leading to the upper floor. The upper floor comprises two twin rooms with separate bathroom and shower and the master bedroom with spacious en-suite bathroom and dresser. The master bedroom and one of the twin rooms share the balcony to the front of the chalet with the views towards the Lac De Verney. On the basement level there is a large garage and storage area (77m2) with a cellar to the rear where the hot water tanks are located. There is private parking for several cars next to the chalet. This chalet would make an ideal family or holiday home. Currently the chalet is operating very successfully on the rental market and has a good client base generating significant income on a yearly basis. This area is very popular in summer and winter due to its reputation with the road cycling as well as skiing. It is only a short (2km) drive to the centre of Vaujany village where the main cable car linking to Alpe d’Huez is located.